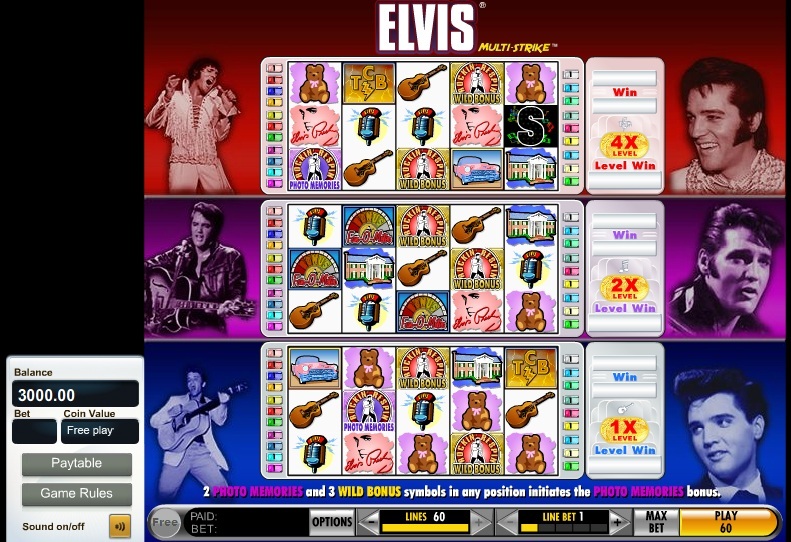 Elvis Multi-Strike video slot is a 2008 release from Wagerworks casinos combining the King’s musical and entertainment charms with the thrill of slot machines. If you are looking for a slot packed full of features, bonuses and Elvis Pressley you will love Elvis Multi-Strike! Play this game at Betfair Arcade or Mr Green. Elvis Multi Strike slot machine is one of the most advanced and feature rich slots you’ll find at any online casino. Combining real Elvis video footage and authentic music from the King himself! The Elvis slot is a 5 reel, 60 payline style fruit machine that actually consists of three separate 20 line slots in one – each with it’s own bonus round feature. Players are given the option of how many of the 60 lines they wish to play. The Elvis slot has a wide range of coin sizes making it a suitable slot machine for any bankroll. When playing Elvis slot machine, the way to start winning is activating a win on the bottom section of the game (the first 20 lines). By doing this you will activate the middle section (the next 20 lines) and if you can win a prize on here it will be doubled! You will also activate the top section of the slot (the final 60 lines) where a x4 multiplier is added to your winnings. This format on Elvis slot allows players to accumulate large winnings relatively easily and adds great excitement and thrills to the slot!